I just LOVE this one! I friend had posted her Sharpie Tie Dye T-shirts on Facebook and I couldn’t wait to try it for myself. 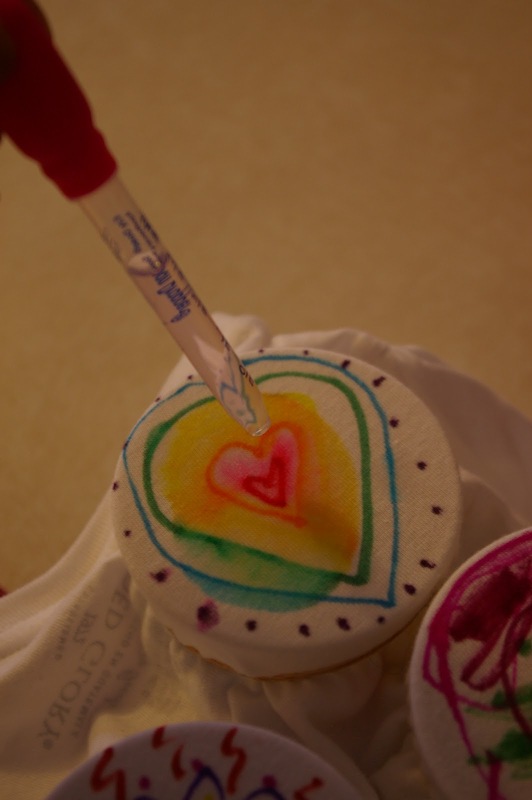 Not only that, I had wanted to do a tie dye project with my Brownie Girl Scout troop, but thought it would be a big undertaking. This was the answer! Who would have thought you could do something so cool with a few Sharpie markers? I have the instructions here for you! Another post that is no longer available since the original site, sunscholars . com is no longer being published. If the original owner would like this tie dye tutorial removed, please email us. 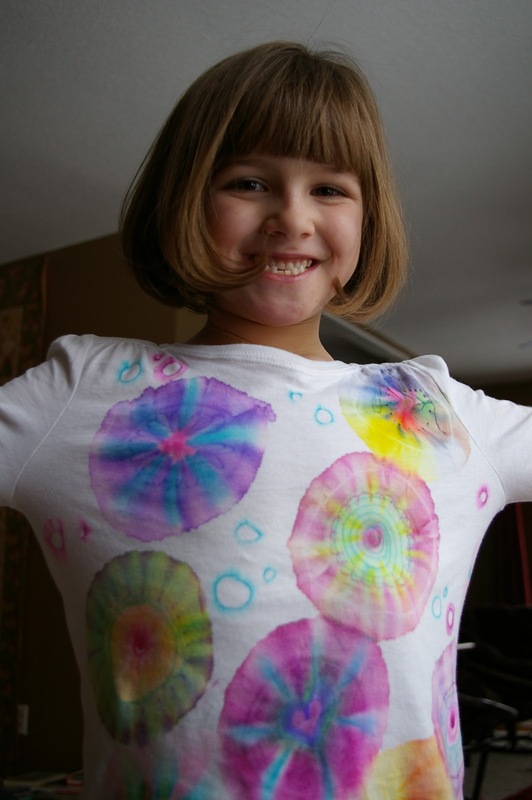 I found a great website that not only shares the directions for the Sharpie Tie Dye Shirts, but also explains the science behind it. 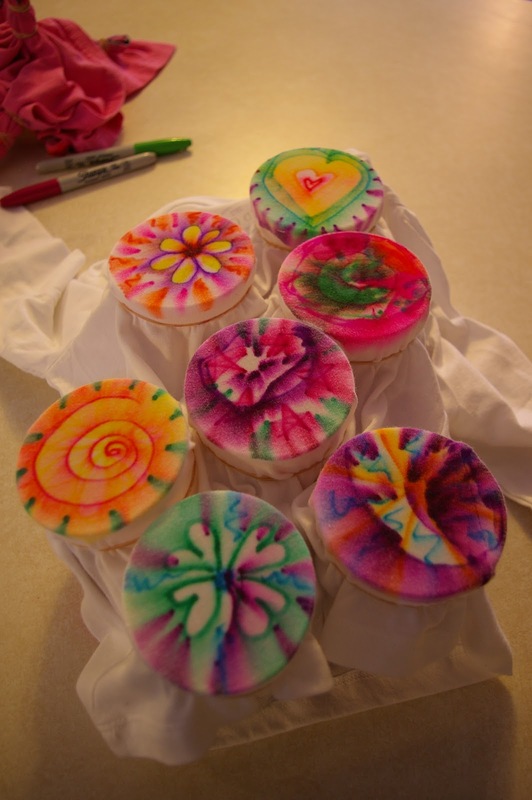 A fun art project and science lesson in one! Check out the link at Steve Spangler’s Science site HERE. We have made several shirts, and tried a couple different techniques. It is very important to remember to heat set the color before washing, otherwise, your colors will fade. I do this by tossing the shirts into a very hot wash and dry cycle before using. I can’t tell you HOW many projects I have used them for! 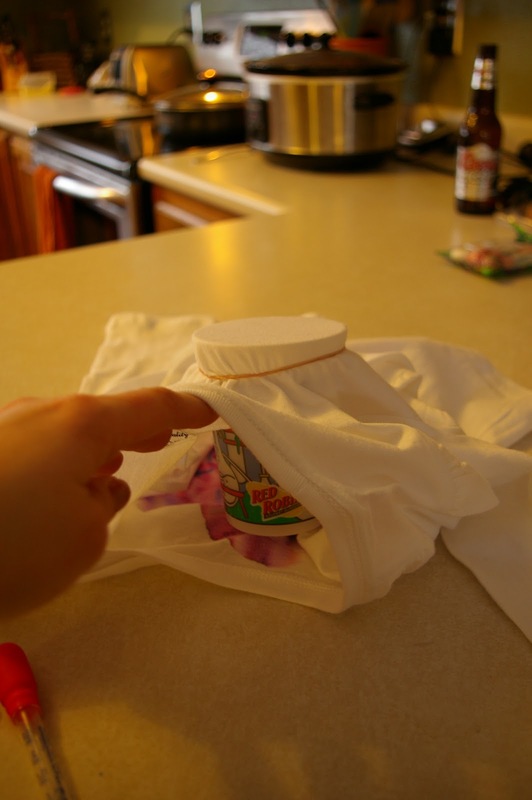 Place cups, open-side up, underneath, securing with a rubber band. We placed as many as we could at one time. 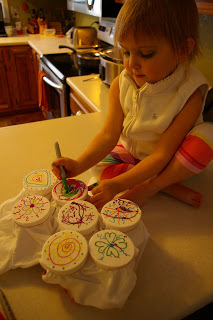 Use your favorite Sharpie colors to make designs on each ‘circle’. 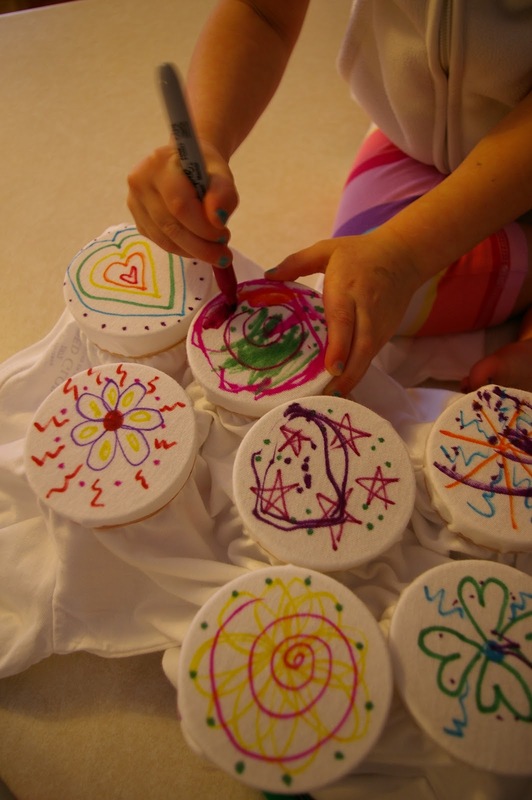 We loved the way dots of color would look in the end, so we added lots of those. You might want to test different colors, as some spread nicer then others too. That’s Tatum, my 3 year old, adding her artistic touch. Use a dropper to add a little alcohol at a time to the center of each ‘circle’. Don’t over-do it! The alcohol will continue to spread for a while after it is added. 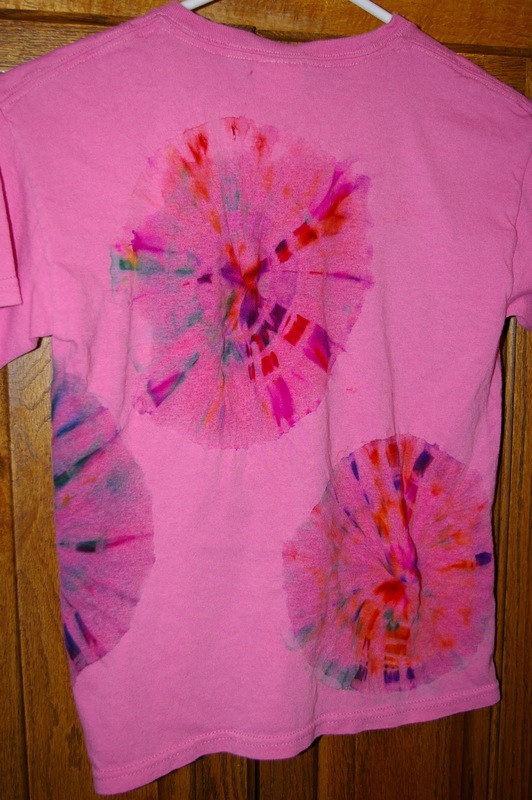 And here is what one side of our shirt looked like after alcohol had been added to the designs. Now you need to wait a bit to allow the alcohol to dry (so not to spread on parts of your shirt you don’t want it to). Once it is dry, you can remove the cups and rubber bands. You may want to add designs on the opposite side of the shirt. Here is the finished back-side of the shirt we were working on above. Grab sections of your shirt and wrap with several rubber bands. Add color to each section you have tied off. We found the best results when we completely colored each section. Use a dropper to add a little alcohol at a time to each tied section. You’ll want to add just enough to spread the color. Don’t over-do it. 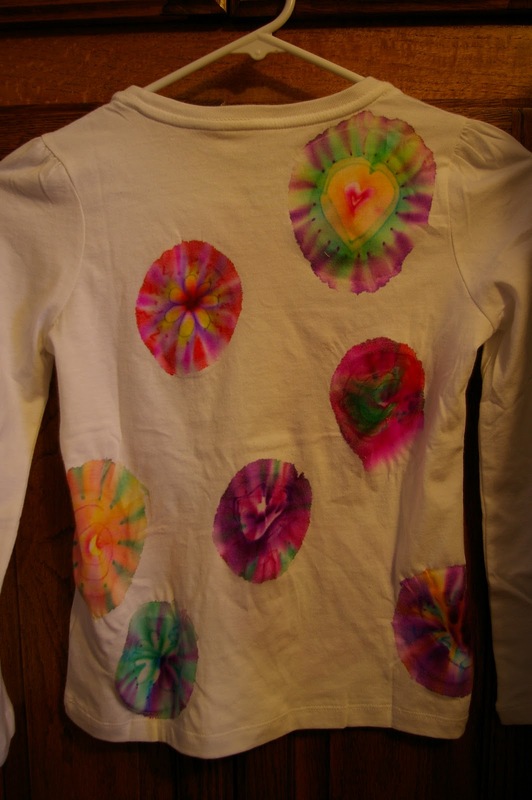 Allow the shirt to dry for a while before you take out the rubber bands. 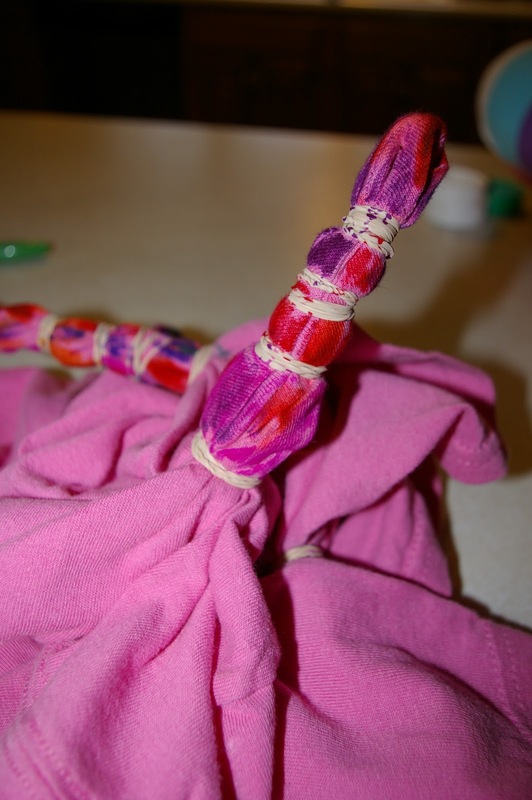 This will keep the color from spreading to where the rubber bands are – which gives it that cool, traditional tie-dyed look. Here is our finished shirt, though I’m thinking we’ll go back and fill in some of the empty spots. I love the look. Many of you have asked about the colors bleeding or fading. We have done it several times now. One time we had some bleeding/and colors were washed away. What I have learned is that you need to do a really good job of heat setting it. I don’t think the iron does a good enough job. I would recommend you first wash the clothing separately in very hot water. After doing that, your colors should be safe from bleeding/fading. Another problem with success can be due to the fabric that you are using. Best success will come from using a 100% cotton. 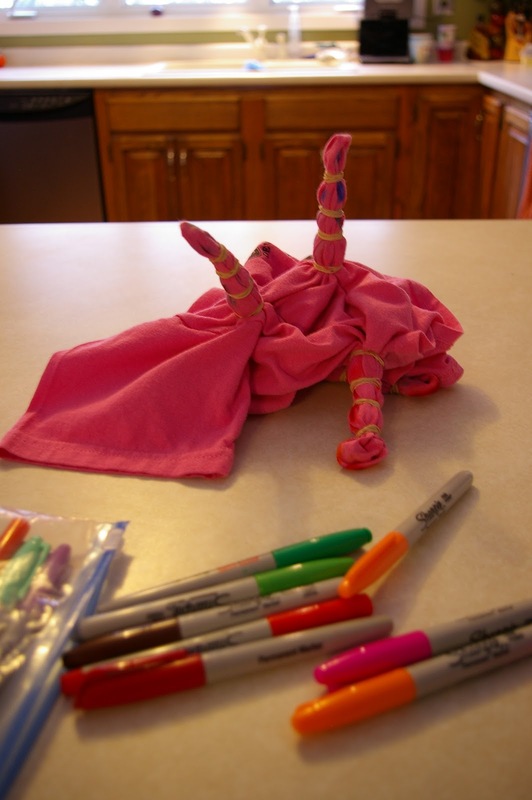 Blends are less likely to hold the color, and your beautiful designs may fade or wash away.